Yesterday was one of those days that makes me realize how lucky I am to live here. It was clear, blue and sunny, with not a bug in sight. It was a great day for a bike ride. 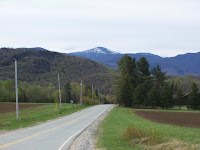 Today's photo is a shot of the Loj Road - note the snow still on the Adirondack High Peaks.